Construction, engineering and facilities installation/management companies must anticipate challenges both current and future, adapting to their clients’ demands via strategies such as risk diversification and recurring revenue models, specialization, and internationalization. These alternatives entail processing a larger and more complex set of information, while simultaneously sharing information internally and externally with organizations, employees, providers, suppliers and project managers. All of this is making more flexible information systems a must-have: flexibility in usage, in mobile capabilities, in functionality and in the ability to supply information for quicker decision-making. On the other hand, these industries are fundamentally project-oriented. That’s why they require specific functionalities that let them prime their follow-up and analysis of business opportunities, create budgets and make projections. Companies can monitor every lead, isolating the profits and losses of each, to maximize the productivity of the resources they dedicate to each project, avoiding schedule and budget overrun throughout the timescale. That’s why it’s critical to be able to control projects’ finances and execution, incorporating all the concrete issues that face construction and engineering projects in the public and private sectors. Axional ERP/CEMIS from Deister allows the complete management of business processes for construction, engineering, and facilities installation companies, incorporating all stages of completed projects from the call for bids all the way to planning, execution, control and delivery, as well as follow-up maintenance. Civil works construction, industrial construction, and architecture. Axional ERP/CEMIS solutions adjust rapidly to a mobile organization like yours. Axional ERP is designed according to a best-practices business model with market-ready software architecture. It provides you with the flexibility to implement these architectures or quickly reconfigure your business processes and workflows. Thanks to its resource infrastructure and suitable communications, Axional ERP/CEMIS can be deployed in a distributed business process and workflow environment (construction sites, sales stands, etc. ), and can be extended over multiple geographic regions simply, affordably, safely and flexibly. Axional ERP/CEMIS makes the management of construction activities more agile. It accelerates approval processes, manages retention and controls cashflow. Axional ERP helps carry out follow-up on construction and engineering projects in ways adapted to the needs of each company, in real time and in a paperwork-free environment. The features of Axional ERP/CEMIS cover the entire management cycle via specific solutions for the construction, engineering and installation industries. It adapts easily to specific companies’ needs and provides access to all necessary information for agile decision-making. Axional ERP/CEMIS offers support beginning with startup and business lead generation processes. To that end, it’s integrated with Axional CRM and Axional Sales Force, providing a centralized point of client interaction via mobile, which simplifies the organization of business tasks and makes the sales team’s coordination more agile. With each call for bids presented to a company, whether private or public sector, the management of the entire lifespan of the project is covered up until a bid is awarded. Each call for bids is connected to the offer(s) made, offer information including technical and financial requirements, and strengths and weaknesses of competitors or conditions of the offer. Budgeting is defined with a data model which lets you flexibly incorporate structures designed to control project finances. Axional ERP/CEMIS also lets you incorporate budgets crafted on other platforms, and vice versa. As far as timeline planning, Axional ERP/CEMIS offers a task planner fully integrated with market-leading project management tools. Projects’ financial and timeline planning can be broadened to include production aspects like allocation of materials, capacity, and human resources. Axional ERP/CEMIS lets you control the execution of your projects through its detailed financial and production breakdowns by budget line. The flow of documents and purchase approvals is fully integrated with budget control. Surveying and certification are added to the budget lines you control, providing a point of view that pairs follow-up on finances and execution with the ability to track changes. Axional ERP/CEMIS provides directors and project leads with functionalities that allow them to follow up on and analyze project execution from various perspectives: profits and losses, price of sale vs. expenses, degree of project completion on each budget line, initial status vs. modified status, and timeline of execution. Considering the full set of activities managed, customers gain a real vision of the profitability of all their projects, whether seen individually or in combination. Integration with Axional CRM and Axional Sales Force, with features specifically aimed at problem areas in target industries. Bid management, with all business opportunities recorded. Budgeting through a data model with detailed breakdowns by budget line. 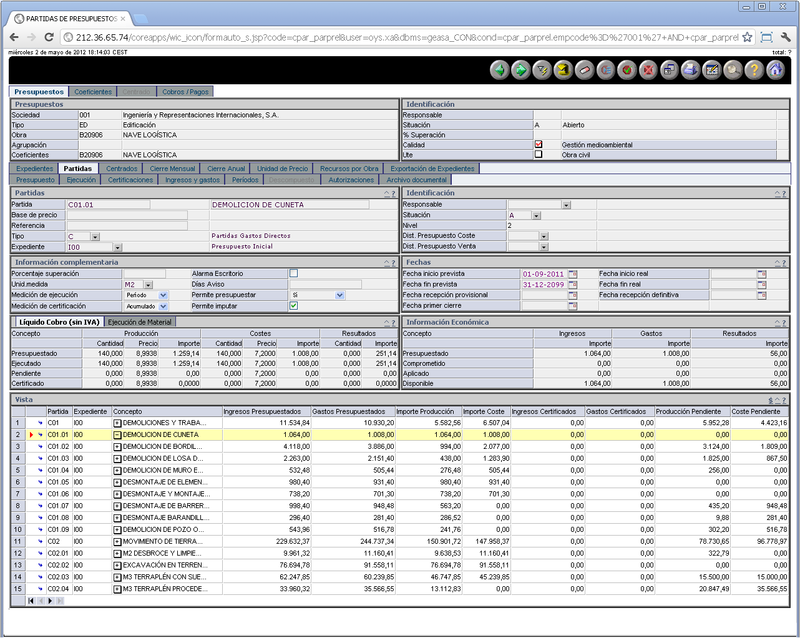 Integration of documentation and purchase approval with financial control over projects. 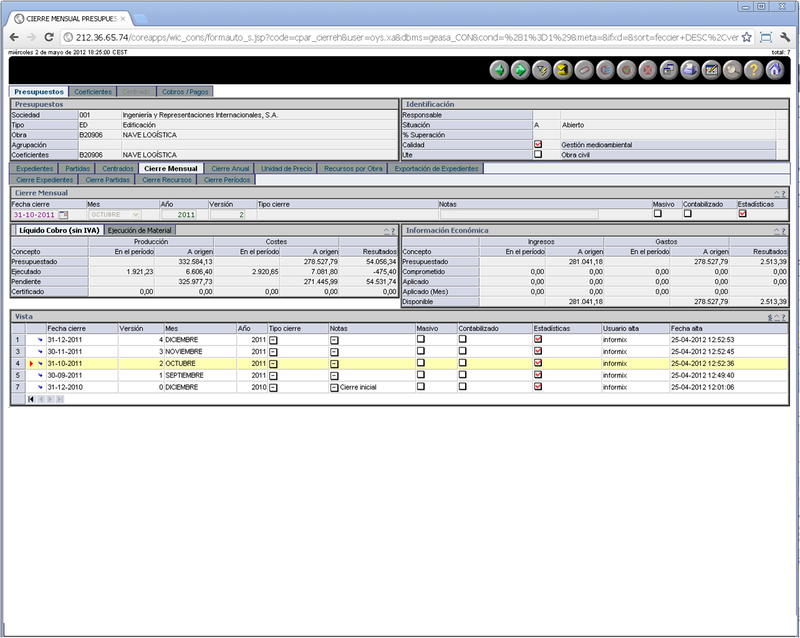 Real-time availability of budgeted costs, applied costs and available costs for each line item. Control over project surveys and certifications. Integration with billing plans. Trackability throughout project execution. Processes include offer selection, supply deliveries, certifications, modifications and complementary additions. Quality control procedures. Worksite reports, progress photos, and all other information relating to quality standards, whether from the internal staff or external subcontractors. Followup and control of post-delivery processes via a centralized repository of all incidents or repair requests, as well as all steps carried out. 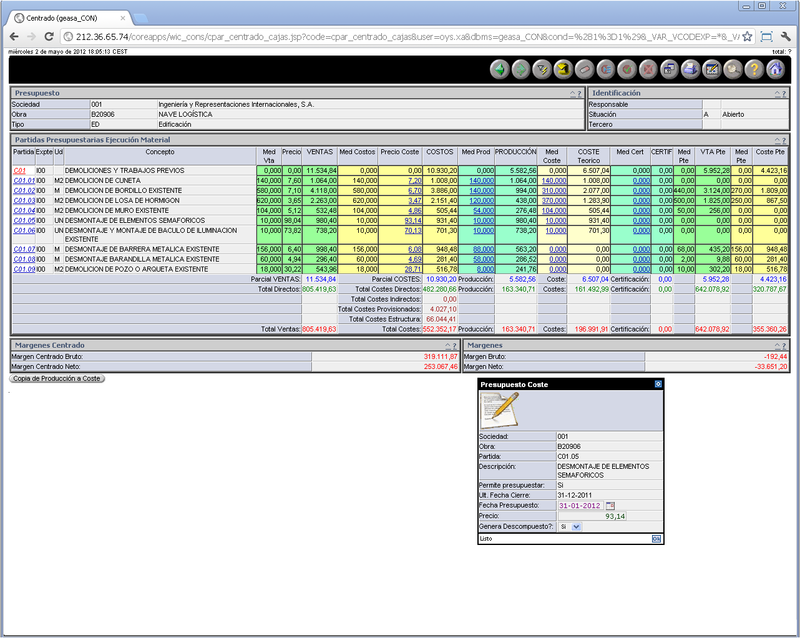 Integration with Axional CMMS for project maintenance management. Multi-currency, multi-project, multi-company and multi-warehouse capabilities. Processes that involve multiple companies, belong to more than one group, or are set up through temporary associations of companies. This means that inter-company purchase and sales processes must be managed with specific automatized procedures, in order to avoid issues with administrative information and productivity. Involve complex financial processes, considering that projects, awarding of bids, etc. require financing, financial planning and complex treasury management. That’s why Axional ERP/CEMIS has functionalities that support all of these processes. The Axional ERP/FI data model is present in Axional ERP/CEMIS, letting you identify any document, record or accounting entry compatible with the budget line model. It also enables specific queries such as the amount of outstanding debt on a project, outstanding VAT validation processes for uncompleted projects, etc. Axional ERP/CEMIS utilizes the Axional ERP Workflow functionalities, as well as document management and collaboration management. Notifications via dashboard, email, SMS, graphic analysis, etc. Integration with Axional CRM lets you dynamically integrate marketing strategies, salesforce management strategies, and business launch activities. It also helps you efficiently carry out support services post-sale, taking advantage of a centralized information repository which results in lower installation and maintenance costs, as well as error reduction. The system is an adaptation of the Axional Sales Force assisted sales module, which guides representatives through a client interaction and helps them achieve preset goals for each visit. This digital assistant uses the idea of “activity” as a potent tool to link actions and tasks to the salesforce’s agenda. All sales activity is organized into actions, which are assigned to representatives to be performed for specific clients. An action is a set of tasks requiring an all-purpose set of data to be completed. Actions may be executed just once, or many times. The sales manager will define actions and set the schedule for their execution. 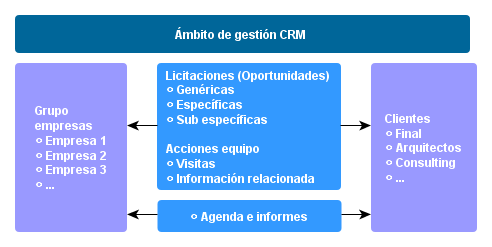 Actions can be assigned to the salesforce manually or automatically. The vendor’s agenda is created automatically through their assigned actions. Sales representatives can, in turn, add their own tasks and, in certain circumstances, modify the execution timeline to adapt to clients’ needs. The agenda is automatically synchronized to receive new assignments or clients, and to notify the central system of completed activities. Axional ERP/CEMIS lets you supervise and follow up on calls for bids and offers in open bids. The bidding team enjoys complete information on each lead, on the actions taken by all parties, on the relevant participants, and on bid details. Managing calls for bids lets you record all business opportunities and bids with which the company is involved, including financial information, technical specifications and documentation, pros and cons, and competition. Information about key bidding dates is also included. Offers may be completed by the technical team, architects, property department, etc. according to the needs of each project. Axional ERP/CEMIS offer management lets customers completely control the offer process, covering both technical and financial aspects. Thanks to the process workflow, available through any Axional ERP element, we can follow up on and authorize different offers and counteroffers, also incorporating business processes. Axional ERP/CEMIS lets you define evaluation criteria adapted to each type of bid. To incorporate formulas for evaluation criteria, users may apply calculation formulas onto configurable parameters, as well as weighted values for each case result. In this way, the portion of the evaluation that can be calculated via formulas is automatized. Appraisal and valuation is then completed with the criteria that cannot be evaluated via formulas, allowing you to include other criteria, such as technical or professional solvency. In the end, each bidder will have their own aggregated result. Thanks especially to the automatized calculation of appraisal via formulas, but including both types of criteria, the system makes it easy to carry out sensitive analysis of the valuation and weight of various criteria for bidders, especially in cases where the weight of certain criteria allows some flexibility, or where two or more offers have similar scores. The repository of bidder valuations also grants you a record of past scores, with details for each evaluation criterion. Followup and status reports for leads, as well as the status of current projects, let you guide your company’s future actions. Axional ERP/CEMIS possesses management information on followup as well as past leads and activities. Bids awarded distributed by organization, macro-organization, bidding company, etc. or filtered-out companies, past records, current-year records, month-by-month followup, with percentages for each status / stage. Business statistics reports which include followup by area of business, organizational unit, ABC client classification, etc. Cost-benefit analysis by offer, by area of business, or by client classification. Results and output are available on the desktop information channels, as well as OLAP tools, making it possible to adjust reports according to each user’s needs. Budgeting is carried out with a budget control data model. Axional ERP/CEMIS also allows you to incorporate budgets created on other software tools and vice versa, based on the BC3 exchange format (FIEBCD, Standard Exchange Format for Construction Databases), commonly used with such products. In this way, in addition to including other documentation such as blueprints, photos, or surveys, clients can include sale budget details line by line. The data model for Axional ERP/CEMIS budgeting lets you incorporate structures designed for flexible control of project finances. To that end, the creation of a budget is broken down into line items, whose dependencies are established through level-based codification, so that the line item code one level higher corresponds to the root of the code of the line items linked to it. In this way, simply codifying successive line items and following a hierarchical tree structure, users can include as many levels as each project’s followup and analysis requires. Budget lines on the final level are the tangible units used for planning and control in lower levels of the structure. The Axional ERP/CEMIS budget data model is complemented by the accounting data model, which allows you to complete analysis from a project-based point of view, with analysis using the accounting report model established by the organization for construction and engineering projects. In addition, the ability to define equivalence relations between the budget data model and the accounting data model lets you define security rules based on a homogenous data model type. The diagram below shows a budget structure in which the final level of line items represents the tangible units of planning and control used for the lower levels of the structure. When a budget is created as a complement or expansion to a preexisting one, one option is to correlate the original budget to the second budget it’s associated with, so that they stay linked and clients can get global control reports for all budgets related to each other. Budgets can be associated with each other with grouping codes, through which budgets are grouped by various criteria, which can be quite useful when gathering reports for a group or even setting workflow validation rules. Axional ERP/CEMIS utilizes standard exchange formats (BC3, Excel, etc. ), allowing the automatic introduction of item trees, sales budgeting, and cost budgeting. Axional ERP/CEMIS lets you define base budget templates which, through an automatized process, create a structure for your budget line items to be filled in at a later date. Coefficients let you recalculate budgetary figures from your itemized lists, based on production or expense percentages for each line. A budget breakdown is submitted for each budget line in the project. Compiling the lowest-level lines in the hierarchy, budgetary figures are automatically calculated for each higher level, successively, up to the general budget level. Each line allows users to detail its functioning or algorithm within the system, e.g. if the line item is by origin or by period (cumulative or periodic), if it can be budgeted or not, if income and expenses can be charged to it, if they are parent-level or highest-level, if they have associated alarms or workflows, etc. The budget breakdown can be created via various methods offered by Axional ERP/CEMIS, each one of them adapted to different specific needs. Record and control a budget line’s figures by setting a period between two dates. Break down budgetary figures by the articles included in that budget line’s set of tangible or intangible resources, as well as forecasted units and estimated price. After each line the amount by article is calculated, and the sum constitutes the total figure for that budget line. Certain articles may have a preset figure assigned to them in order to budget the project in a homogeneous, predetermined way. This tends to happen eventually in public works budgets, in which the contracting administration determines preset prices and units for each stage of work. In these cases, a shared budget repository is available in order to inform the catalog of articles and prices, accessible from every line in the budget. If the price of an article or unit is modified, a recalculation process is available for budgetary figures pertaining to lines created by units. Axional ERP/CEMIS makes project planning and suitable management easy. It lets users define a plan made up of a set of tasks which can eventually become dependencies. Each task has its own execution status, referring both to its financial and timeline state, which lets you verify the project’s degree of progress at every step. The planning functions also support simulation of forecasted scenarios. Axional ERP/CEMIS follows a hierarchical structure made up of various grouping levels: projects are made up of tasks, which in turn can be broken down into more detailed tasks. No limit exists on the number of detail levels associated with the tasks a project is built on. Each task can also be correlated to other tasks, eventually, via project financial control. Integration is made easy with market-leading project management tools, which allow budget lines for upcoming work to be managed within these applications, incorporating date changes, task precedence, available resources, etc., in a user-transparent way. A preset format for printing is available for the opening worksheet, used for initial communication or resumption of activity on a project. Documentation and purchase approval processes are integrated with financial control over projects. Starting with the first stage of management, purchases linked to a construction project are added to budget control, reflecting the level of application of budget assignment and according to its stage of progress in purchase management processes. Supplier offer management allows the organization to perform complete followup on the cycle from application to offer to comparative valuation and decision to purchase. Suppliers can consult the requests for contracting bids currently in progress, increasing their agility and visibility throughout the contracting cycle. This results in lower subcontracting and purchasing costs. WEB Services for publication of items which companies wish to acquire. Electronic notification of frequent suppliers in the bids being drawn up. 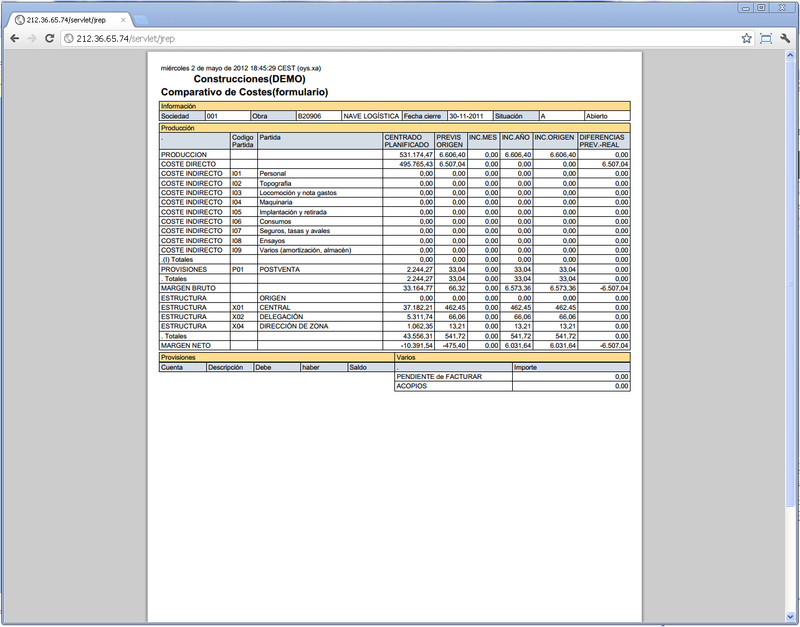 WEB interface to help the supplier connect directly to the system in order to report: prices, discounts, product image attachments, technical documentation, etc. Security profile management to control supplier access. Comparative analysis system to be used with multiple suppliers. Provider bid-awarding proposal for one or more articles. Electronic notification of bidding results to suppliers. Purchase tax calculation based on data received from the supplier. Ability to generate open orders or periodic programming, based on the seasonal nature of products. The Axional ERP/CEMIS budgeting area receives financial data from the modules in which documents related to construction projects are filed, but also from purchase and sale documents (orders, acknowledgment of receipt, supplies, shipping, billing, etc. ), the cash register subsystem, warehouse consumption, or activity recorded manually in budget lines. Each budget line has an income and expenses area, where the origin of activity is identified to make future user consultations easier. All income and expense activity updates the amounts charged and added to the budget line. In the case of activity originating from management documents, while these advance through the document flow of the purchase and sale process, their progress is automatically reflected in the application status of income and expenses on the line(s) to be charged to. The approval workflows for each document also permit or refuse the addition of new amounts to a budget line. This linking process is also established from the budget with regard to document workflow validation. For example, factoring in the budgeted-for amount vs. the available amount for that line item. Financial information on a project’s income and expenses is divided into two statuses, each of which corresponds to an application level. This division lets you compare changes in income and expenses relative to the budgeted-for amount, in a way more accurate to the progress that amount has made. This type of activity will originate in management document validation, e.g. agreements, applications, orders, acknowledgment of receipt, supplies, shipping, etc. This type of activity will originate in the validation of bills, purchase or sale documents, or the various financing models which interact with investments. They may also be introduced manually into the table itself. Via income and expense control on a line item level, more detail about the stage of progress of financial charges is obtained, in a simple and agile way. This means user time saved and information integrity guaranteed. To facilitate the direct assignment of employee hours and expenses, an Hours and Expenses assignment master is available, to which a billing account can be associated to record the amounts introduced. If employee expenses per hour are being assigned, an hour assignment tax master is available. Axional ERP/CEMIS lets you restrict budgeted quantities so that they cannot be exceeded. It also accepts percentages or amounts of permissible excess. Any restriction of costs can be applied to the entire budget or any line level, relative to the amount added to the lower-level budget lines dependent on the line which is exercising this control. This functionality means that although some lines may be exceeding the budget limit, therefore blocking the assignment of more expenses, the budgeted amount assigned to that level is not exceeded, and new expenses are accepted on other lines. A broad range of reports and preset printing formats are available for budget followup. Axional ERP/CEMIS facilitates complete segmentation and handling of costs and income related to each project. It lets you obtain a precise, real-time image of the financial volumes budgeted for, committed to or effectively consumed as the project progresses, as well as detailed analysis of quality, documentation, activity or work units, etc. Indirect purchases, distribution across multiple projects. Assignment of indirect and structural costs, including various distribution criteria: percentage, volume of direct costs, etc. Transfer of material/costs between projects. Calculation of costs by the difference between resource consumption/payments and billing/income. Cashflow management by project or by organizational unit. Analysis and comparisons of costs and deviations by project, expense description, or organizational unit. Axional ERP/CEMIS is essential to anticipate future issues or cost improvements. It lets you create a statistical cost breakdown, whether bottom-up or top-down, creating an income and expense forecast according to the estimated curve of project evolution. Within a project, budget lines are grouped into Record contracts, providing us with a double vision: the record and the project as a group of various contracts, which may correlate to different clients, prices, methods or billing plans. This allows you to perform followup by contract and by annuity. 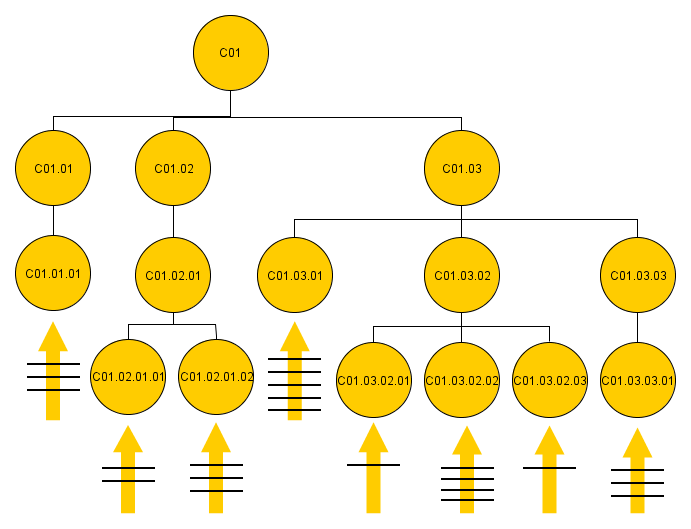 Each line has its own execution and certification control. Execution control allows you to introduce execution measurements in order to evaluate the stage of completion of each line, comparing the progress of execution with certifications and the financial control of each line. Axional ERP/CEMIS supports complete followup on certifications associated with projects, whenever it may be necessary. 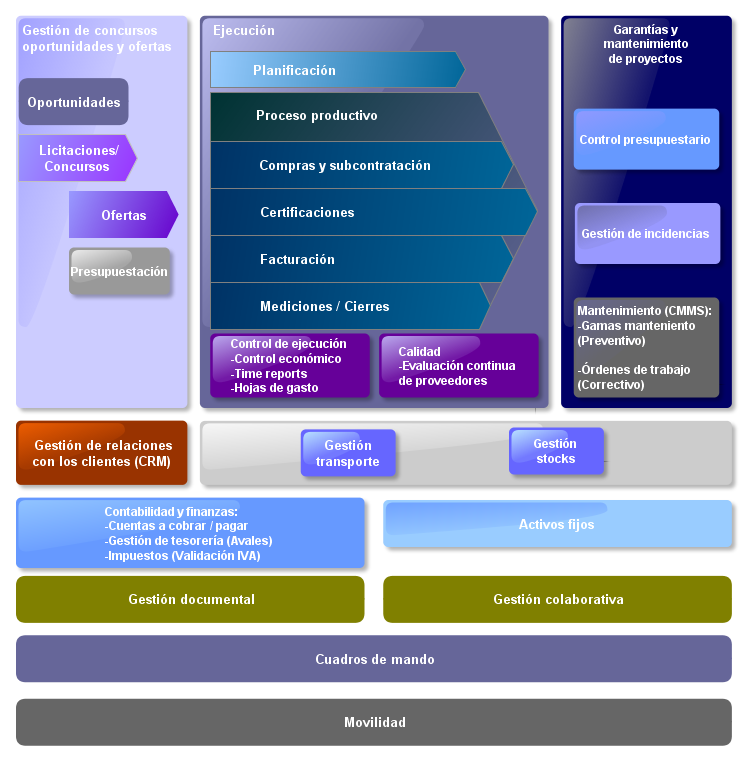 The base measurement for certifications incorporates the percentage of certification as well as production units. Through the certification breakdown, aggregated information on units and certified prices are updated line by line, giving you the total amount of certified income and expenses for that line. With regards to the date of each certification, measures are in place to prevent submitting a certification dated to an expired period. Axional ERP/CEMIS facilitates risk management with lists that show expired insurance certificates for subcontractors. Incidents on the job can be reported and resolved from moment to moment. Axional ERP/CEMIS contains automatized processes for both partial and annual closing, which allow you to partially close budgets as well as individual records and line items within each budget. With these processes, you can obtain a snapshot of the budget, records, and line items up until the date of closing. In addition, when measurements and certifications are carried out prior to closing, the date of closure is reported so that modifications to records will be prevented. Introduce certification measurements and (as we will see later) forecasts for estimated construction curves. By milestone with an invoicing plan. Forecast invoicing according to contract conditions. Axional ERP/CEMIS lets you distribute supplies according to the grade of progress/certifications, outstanding invoices and closure projections, all with the goal of obtaining a real snapshot of the project. Status progress control is available on a budget, line item and record level. This control is related to the ability to assign budgeted amounts or assign income and expenses. For followup on post-delivery processes and warranties, Axional ERP/CEMIS is integrated with the claim/incident module of Axional CRM, to provide you a centralized repository where you can report all incidents or requested fixes, as well as completed tasks. In this way all incidents, improvements and fixes, as well as the review list, are centralized for one complete vision to follow up on claims. To manage completed tasks from a maintenance perspective, Axional CMMS is available, making it possible to link developed tasks with the post-delivery support project created ad hoc. Guarantee and warranty management lets you introduce guarantees and agreed-upon financial conditions. It also lets you introduce sections with different conditions and dates in effect, which the system uses to automatically calculate the commissions and interest to pay for each guarantee, generating corresponding treasury activity in order to reconcile them with bank statements. Control requested guarantees and granted guarantees. Record and update guarantee conditions. Generate forecasts by guarantee commission. In the construction industry, you are likely to find cases in which tax records, VAT records and/or withholdings for issued or received invoices are not validates until the moment of partial or total work certification. When this certification is finalized, the corresponding VAT is calculated or validated. That’s why the Axional ERP/FI – Taxes model has an automatic tax validation process which calculates VAT. The process factors in possible cases of different application percentages, in which the difference in IVA is accounted for. To give one hypothetical example, imagine that the calculation of non-validated VAT may be realized during a month in which the VAT rate is 16%, but VAT validation occurs during a later month in which the VAT rate has risen to 18%. In this case, the amount of difference between types of VAT application will be noted in a third party account. The Axional ERP/FI data model is present in Axional ERP/CEMIS, allowing you to associate the origins or applications of bank statement activity to budget lines. This is reflected in Axional ERP/FI – Treasury, linked to income or expenses by budgeted project. Forecasted cashflow is obtained via treasury budget projects. The treasury budget is a flexible Axional ERP/FI – Treasury tool used to exercise control on firm treasury budgets that are still outstanding, as well as medium-term cashflow. Budget information for construction and engineering projects is integrated into the medium-term treasury, completing the cashflow forecast with available money for construction and engineering project budgets – that is to say, money that has not already been committed or executed. With Axional ERP/CEMIS users can generate forecasts through accruals on budget lines and treasury followup, based on forecasted cashflow and cashflow from completed projects. In this way, treasury planning is better adjusted to committed income or expenses that have been forecasted by the projects by which budgets are defined. Authorizations workflow, such that if a circuit does not meet pre-established rules, alerts are designed to go off so that responsible parties can choose whether to authorize the user’s variation or not. 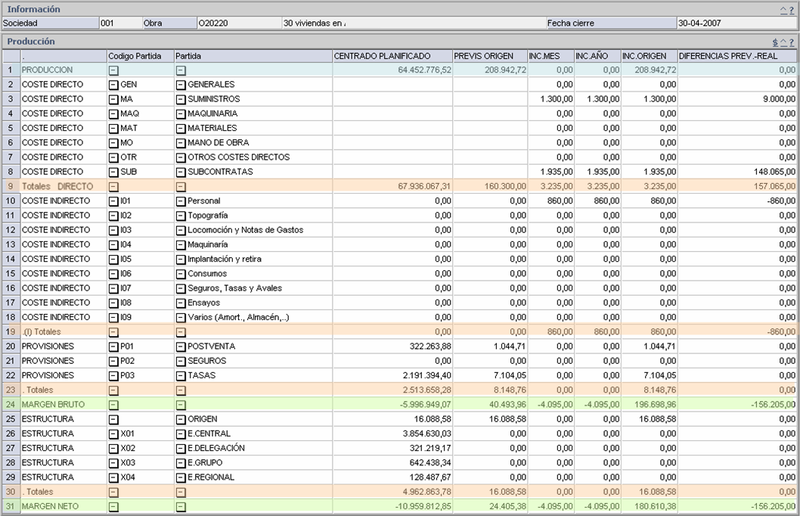 Real-time followup of expenses vs. budgets, with your preferred level of detail or aggregation. An alert system is also available to help you react moment to moment, reducing potential delays. Minimize time and errors when introducing income and expense assignments to budgets. Reduce the time dedicated to management tasks like assigning hours and general back office. Flexible, centralized management of user profiles, with multiple levels of permissions and security. Includes the entire management cycle all in one system and one company-wide standard, reducing the learning curve for new employees. Knowledge management integrated into the data repository. Provides better-summarized information to project directors and site managers, with the ability to navigate through details. Detailed information by activity, which facilitates the assignment of responsibilities and contribution incentives so that projects are completed on schedule and under budget. Points out possible areas of conflict, identifies variations as soon as they’re created, and notifies users. Offers support to help recognize un-billed income. Support abilities for decision-making and organization management. Improves the lead / bid request management process. Manages all aspects of contracts, allowing you to meet the commitments made in a short timeframe. Unified management of subcontracting cycles and materials purchase cycles, incorporating the corresponding procedures (process workflow). Improves the followup and control of subcontracting quality, measured by provider and type of activity. This aspect helps improve subcontractor management, especially with regards to quality control. 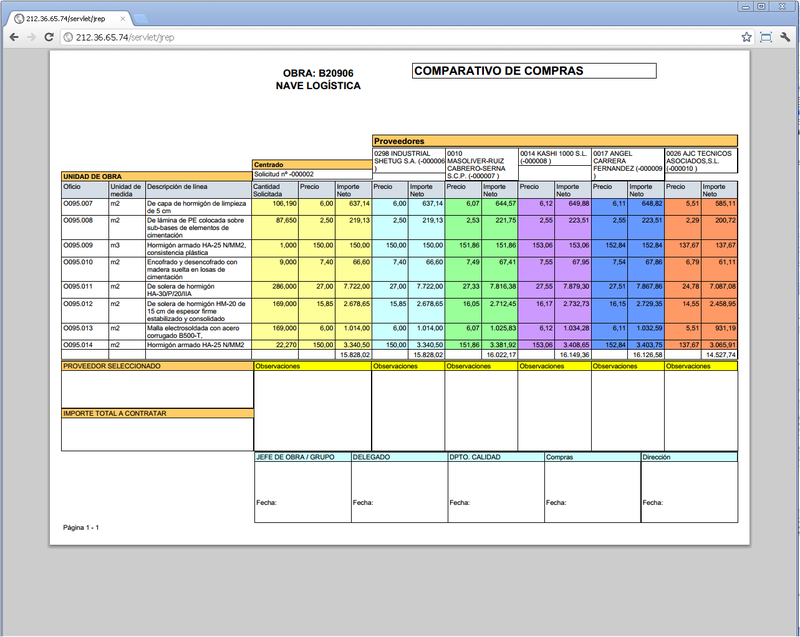 Automatized assignment of Indirect Costs, Supplies and Structure to budget lines. Easy incorporation of price alterations and revisions via independent records. Consistent followup on the progress of forecasted margins, thanks to cost planning and re-planning capabilities. Improve liquid asset management with estimated liquidity requirements, either on a global level or by account, project, etc. Better agility and consistency in VAT validation thanks to integration with Axional ERP/FI and an automatic tax validation and accounting process. Available detailed breakdowns of charges and withholding tax.